​So, you’ve established an idea for a YouTube video – a concept, visuals, script. You’ve been busy writing, planning, projecting, and casting. But what about background music? You weren’t planning on a silent movie, were you? Surely your video needs sound to be complete. Your next thought is okay, I just have to surf through my playlists and grab some great tunes. Not so fast. Unfortunately, there is a caveat. Videographers beware of copyright infringement. YouTube has rules, and you’d better follow them or your debut will never hit the box office. To really establish full protection, the composer must register his or her piece with the U.S. Copyright Office. Courts don’t like grey areas. This fills in the blanks with a black ink pen. And forget the old “Poor Man’s Copyright.” This is the method where you mail yourself a copy of the work and keep it in a sealed envelope. Not happening with modern copyright laws. A piece of music officially copyrighted through the proper channels offers airtight protection, so YouTube creators, don’t let your guard down. The content police at YouTube are on the alert. Did you know that YouTube developed a Content ID system that can detect illegal use of copyrighted music? You can’t fool YouTube. If they find that there is a misuse of content, your video can be taken down or blocked. The copyright owners can even track the video’s viewership statistics to determine if you monetized the video and should consider coming after you for funds. How in the world would YouTube ever know if a music selection you plucked from the depths of the web is legal to use, you ask? They will more than likely find out. Copyright owners can use a system called Content ID to maintain their musical content on YouTube. Videos uploaded to YouTube are matched against a collection of files that are stored in an internal database. YouTube catches you red handed. What happens next? Your fate is in the hands of the copyright owners. On a good day you may get a slap on the wrist. Or, the owner can initiate a Content ID claim. They can force you to take your video down. YouTube will slap you with a Copyright infringement strike on your profile. This may prohibit you from certain privileges as a user. Not to burst your creative bubble, but now there is an extra step in the artistic process you may not have counted on. 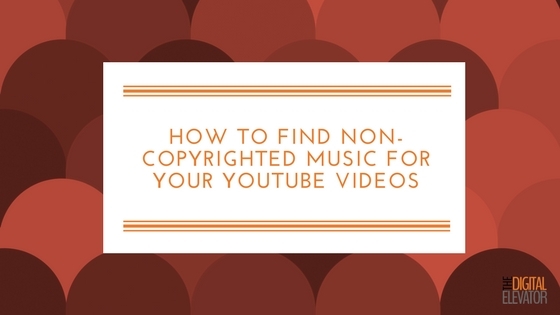 Content creators and film makers are faced with the daunting task of searching for non-copyrighted music for their project. Fortunately, there’s a treasure trove of non-copyrighted music out there. I’ve done the research, and there’s a pretty robust list of musicians and entities offering their music free of copyright restrictions. YouTube has very graciously compiled a robust library of free music for the taking. Launched in 2013, this collection is chock full of tracks to use as background music and sound effects – all legal and royalty-free. Let’s face it. YouTube is not in the business of tearing down videos. But they will if they have to. So, they’ve made it easy for you to not do anything unauthorized. This is a global effort to share music legitimately. They’ve built platforms that make it easy to navigate royalty-free, non-copyrighted music works, with the intention of collaboration and creative cooperation. You may have to properly attribute the work according to the agreement executed by the creator. But it’s pretty easy to explore; you simply search for the genre or style of music you’re looking for and you will be directed to a host of options. The individual piece you are interested in will have its usage parameters posted clearly. I really like this anthology because of its simplicity and streamlined catalog. Visually it’s very easy to maneuver through collections. There’s a generous amount of music to choose from, covering jazz, rock, cinematic, acoustic, and more. The covers are finished with artsy images, making sifting through the selections an engaging, fun experience. With a cool and funky vibe, users are invited into a surreal universe of tracks with virtually infinite musical compositions. Although they house the usual contenders like dance and retro, their approach is slightly off-beat offering titles in the creepy, sneaky, and tense domains as well. The ubiquitous Facebook houses a decent supply of non-copyrighted tunes on this link. Not quite a promised land of scores, but enough of a variety to keep you hooked for a bit. You may get lucky here, especially if you’re looking for a unique, standout tune. I also spoke to Tim Stockman, CEO of Blue Dog Video, to get his take on where video production companies are getting their music. He said he uses a combination of Audio Blocks and Audio Jungle. "Sometimes to find the perfect audio clip," he says, "you have to pay. But you'll find the music much more original." If you venture out on your own to hunt down other sources for non-copyrighted music, just be careful to read the fine print. Some websites charge hidden fees for usage, don’t adhere to restrictions in their entirety, or prohibit use in certain situations. Hell, even this list is subject to change. If you see any that are no longer free or have suggestions to this list, please let me know in the comments. When it comes to your YouTube video you worked so hard to create and publish, better to be safe than sorry. Be sure the music you choose abides by the copyright rules set forth by YouTube. NEED HELP WITH YOUR VLOGS? Digital Elevator has partnered up with high-quality, affordable, video production companies that work with TV commercial clients and self cell phone shooters. Contact us and let us know what your goals are and we'll let you know what we can do.